In 1928 Calvin Coolidge was president of the United States. Babe Ruth had just hit 60 home runs in one season for the New York Yankees. Charles Lindbergh was a national hero for his solo nonstop flight from New York to Paris. And in the small farm town of Mason City, local officials were making plans to celebrate an anniversary with a little band music. Band Festival 1936 that is how it all began and has continued. The North Iowa Band Festival started humbly, grew rapidly, and has attracted touches of Broadway and Hollywood through its long and stories history. The underlying theme has always been the same- the harmony of wholesome entertainment for young and old alike. The first band festival was held in 1928 in observance of Mason City's 75th anniversary. Few high schools had marching bands back in those days, but the festival was held nonetheless. Five local high school bands joined the Mason City High School band to provide music for the anniversary celebration. Eight years later, the Iowa Bandmasters Association held its annual meeting in Mason City and the festival was revived. The 1936 event was equally as delightful its predecessor... and three times as big with 18 bands participating. The success of the 1936 Band Festival prompted organizers and other citizens to plan a similar event the following year. Thus, in 1937, the second successive festival was held, the third overall... and a tradition was born, one that in the next half-century was to include the likes of Meredith Willson and the cast of a Hollywood movie, and thousands upon thousands of high school musicians. Memories abound: Meredith Willson grabbing a drum major's baton and leading the parade; premiere of the Music Man movie; the Iowa State Lottery holding a special lottery drawing in Central Park to highlight the 50th anniversary in 1988; relocating festivities to spacious East Park in 1992; the scramble in 1993 to move everything back downtown because East Park was flooded; a torrential rainstorm that soaked everything... and everybody... in the 1996 parade; the addition of kings joining queens as high school royalty in 1997 – and more! The 1938 the festival featured 47 bands and was held in conjunction with the centennial of the Territory of Iowa. The crowning of the first Band Festival queen, Shirley Morgan of Sheffield, Iowa also took place that year and would be a continued tradition. The popularity of the annual festival continued to grow, and in 1941, 56 bands participated. This was the second year in a row that more than 50 bands would be marching up and down the city streets. Six months after that festival -thousands of miles from Mason City, Japanese planes bombed Pearl Harbor and America was plunged into World War II. The annual Band Festival, like most other activities in this country, was affected. A festival was held in 1942 but none were held for the next few years. 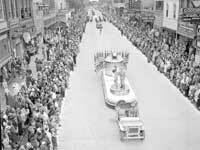 In 1945, the Band Festival returned and was held in conjunction with the centennial of Iowa's statehood. It was altogether fitting that the resumption of the festival returned the same year that Lester Milligan of Mason City was chairman of the State Centennial Committee. Milligan was a founding father of the original Band Festival in 1928. The first post-World War II festival was a five-day celebration that included participation by the military. The United States Army Band began a 10-day Iowa tour by participating in the Band Festival. Music is an important part of Iowa’s history and Mason City has been the link that binds them together. The 1928 festival helped commemorate Mason City's 75th anniversary. The 1938 festival helped pay tribute to the centennial of the Territory of Iowa. Now, just eight years later, the centennial of Iowa's statehood was being saluted. As had been the custom for several years, the culmination of the festival was the amassing of all the bands. This took place on the high school football field (Roosevelt Field) for a mass concert under the guidance of a guest conductor. In 1950, 87 bands participated in this exciting time. 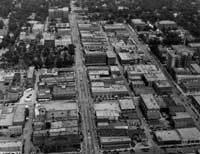 For the 15th festival in 1953, Mason City celebrated its 100th birthday. 100 bands from throughout the area participated- one hundred bands! 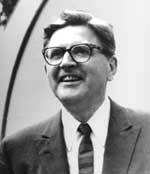 Native son Meredith Willson, who was now a successful songwriter, participated in the 1953 festival, adding his special touch of enthusiasm as he had in three of the past five festivals. In the next decade Willson's fame would soar, and with it, a new name would be applied to the hometown that he loved: "River City." Willson, whose work "The Music Man" ran on Broadway for 1,376 performances would return to Mason city many times to have good, old-fashioned hometown fun at the North Iowa Band Festival. "This spectacular unit, made up of 203 musicians including 11 tubas and 11 drums, was selected from 22 of the participating school bands. The bands were arranged in alphabetical order by towns, headed in each instance by a queen candidate riding in a convertible ... Floats were interspersed between every third or fourth band. 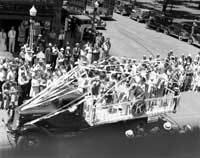 The last 12 floats in the procession were the special 'Music Man' floats which told the story of Meredith Willson's musical comedy hit in colorful tableaux." On June 19, 1962 the Warner Brothers production of Meredith Willson’s, "The Music Man" announced that the film would premiere in non-other than the great "River City”. The man who was "The Music Man" of stage and screen, Robert Preston, would be on hand, as would co-star Shirley Jones. She later starred in the television series "The Partridge Family" and has appeared in many other movies, stage plays and television shows. But she will always be remembered in Mason City as "Marian the Librarian." Of course, Willson came too and Arthur Godfrey, who served as master of ceremonies for the premiere, which was televised. Godfrey may not be a household name to current generations, but in 1962 he was as well-known to television audiences as David Letterman is today. In the middle of all the Hollywood excitement the North Iowa Band Festival was gearing up for their 24th celebration. Bands from all 50 states were invited which made competition keen. The grand prizes included a national tour for the winning band. A total of 121 bands participated in that memorable festival, with the musicians from Lockport Township High School in Illinois taking top honors. Second place went to Bossier City, Louisiana; third place to Lebanon, Pennsylvania; fourth to Plainview, Texas; and fifth to Sidney Lanier High School of Montgomery, Alabama. "I doubt if Mason City or Willson will ever forget this day. Nor will this writer, if only because she got to see the corn growing again, sat under huge, dark green shade trees and on velvety lawns, and smelled the wonderful scent of the meadows and clover... and when this disciplined and talented young America proudly paraded with heads high, playing beautiful music, much of it patriotic, something said to us, 'Don't worry, all is well with our youth. Meredith Willson returned to lend a helping hand for the 30th Band Festival in 1968. An unexpected tornado ripped through Charles City on May 15th and left much of the town in ruins. The high school however, had somehow been spared and the Charles City high school band members unanimously to participate in the North Iowa Band Festival less than a month later. Understandably, not all band members could come. As Band Director Robert Gower explained at the time: "Several of our members have construction jobs as a result of the tornado, and could not be here." Despite the tragedy in their hometown the little Charles City band stole the show. Throughout the next 20 years Band Festival saw subtle changes, brought on by changing times in education. School districts were merging, creating one school where there had once been two, and dwindling school resources made lengthy travel a luxury many districts could not afford. The days of 100 or more bands participating in the 70’s and 80’s were gone. Still, fewer in numbers but no less melodic or enthusiastic, the bands played on. In 1985 and 1986, the festival was switched to a fall date but in 1987 was returned to its traditional spring format of the first Saturday in June. That meant that in the 1986-87 school year, there were two festivals, one in October of 1986 and one in June of 1987. This was the first time one school year experienced two festivals’ - half-century after it all began, the festival was still experiencing "firsts". Another change in the festival was the parade route. In 1984 bands could no longer march straight down Federal Avenue Southbridge Mall had been built smack in the middle. This prompted the parade to shift slightly, but only on concrete- not in spirit. Also, in 1984 Meredith Willson, the very life and breath of music in "River City", passed away. He died in California but fittingly; his funeral and burial were in his beloved Mason City. At his funeral, Mason City Mayor Ken Kew remembered Willson's fun times in his hometown's Band Festival when he eulogized the musician. The 1987 June parade drew national attend from the Los Angeles Times. With attendees in short-sleeve shirts and blouses, this was the official kick-off to summer. The writer told of the Meredith Willson heritage in Mason City and said, "Not surprisingly, Mason City High School has one of the top music programs in the nation and the Mason City High School band consistently ranks among the best in America." This still rings true today. The 50th Band Festival in 1988 was a three-day celebration that included the spinning of the Iowa State Lottery's giant "Million Dollar Wheel"; televised statewide, live from Central Park in Mason City. The weekend also featured a live stage show of North Iowa actors, actresses and musicians performing Broadway hits and jazz favorites. "Middle School Mania", was a party in the park for sixth, seventh and eighth graders with games and of course, lots of music. Among those attending the 50th festival was Iowa Gov. Terry Branstad, Willson's widow, Rosemary, and Kew, now a former mayor. This would be Kew’s last hurrah as master of ceremonies for the Band Festival Queen competition. He passed of cancer a month later. In 1989, the illustrious event began its "Second 50 Years" by keeping with an old tradition of great music and starting an exciting new tradition- the awarding of four $500 music scholarships to high school musicians who performed before judges to earn the scholarships. Another highlight of the 1989 festivities was an appearance by Bill Haley's Comets, named for the legendary 1950s singing-group. North Iowans "rocked around the clock" at the memorable Saturday night concert that prompted spontaneous "jitterbugging" by many in the audience who were caught up in the nostalgia and excitement. The second half-century of band festivals off to a rousing start! In 1990, the unthinkable occurred: It rained! A drizzle that started shortly before the 10AM start of the parade became a full-fledged downpour by the time the last of more than 100 parade entries marched down State Street. The Ventura High School Queen candidate, Jody Schichtl was riding in a convertible that was the 114th parade entry, she said: "Right as we got into downtown, it really started to rain. My umbrella blew up, pulled me forward, and hit driver in the head." That's not the only reason Jody will remember the 1990 Band Festival. Later in the day, she was crowned festival Queen! Her mother, Judy, was 1954 Band Festival Queen, representing Corwith High School. Jody's "coronation" in 1990 marked the first time a mother and daughter have each been crowned as Queen. Another "first" in 1990 was the formation of an "alumni band," made up of former Band Festival musicians, led by Mason City School Superintendent Dr. David Darnell. Activities concluded with a Saturday night concert-featuring singer Ben E. King, who performed in the North Iowa Area Community College auditorium instead of in the rain-soaked park. In 1991, we saw pride and patriotism mirrored through the Band Festival music. Between the 1990 and '91 festivals, America had been at war and North Iowa had been affected deeply. The 1133rd Transportation Division of the Iowa National Guard, based in Mason City, was called to active duty by President George Bush the previous October and had been in the Persian Gulf for eight months. In Mason City and throughout the country, trees were adorned with yellow ribbons, a silent tribute to the troops overseas. Most of the people watching the 1991 Band Festival had a friend or relative serving in the Persian Gulf or knew of someone who was. In the afternoon festivities, patrons were treated to a concert by the Strategic Air Command Band - a 60-piece group from Offutt Air Force Base, who saluted all the armed forces with a rousing medley of military anthems. 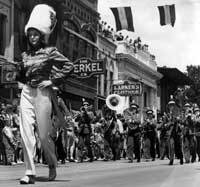 A year later, in 1992 the Band Festival was revamped with a new parade route. East Park was created just East of State Street from downtown Mason City. This would be the location for the activities, entertainment, craft show, and car show. A “Root Beer Garden” was hosted by many volunteers and sold over 3,000 floats Saturday! The Band Festival Committee was busy planning for even more root beer floats at the 1993 festival when the unthinkable happened again: it rained 23 days in May, saturating East Park. On the Wednesday before the festival (June 2) the decision was made to move the festival back downtown to drier grounds. In order to accomplish this, city council approval was needed for all the necessary street closings and the law required 24- hours’ notice before a council meeting! Mayor Bill Schickel convened the city council at 4PM on Thursday, June 3. The council adjourned at 4:10PM, having approved everything necessary to move the Band Festival. At 4:30PM, an alternative stage was being constructed downtown and a little more than 24 hours later, thousands of North Iowans were rocking to the music of the Backstage Band and Soft Thunder as the 55th Band Festival. By Sunday night, 4,200 root beer floats had been sold. A highlight of the 1993 festival was presentation of the first “Band Festival Service Award” to 101-year-old Dan Klempnauer. Klempnauer, who had managed Damon's Department Store downtown, was the first chairman of the festival in 1936 and served in many capacities in the festival's early years to help get it off the ground. Nearly 60 years later a crowd of several thousand, gave Klempnauer a standing ovation as he was presented with the first service award. Rosemary Willson, Meredith's widow, returned to Mason City in 1994 to be the “Grand Marshal“of the parade 10 years after her husband's passing. The service award was presented to Dolores Kew, widow of Ken Kew, the former mayor and the man who had delivered such a stirring eulogy to Willson a decade earlier. The 1995 festival was highlighted by the most popular parade unit in festival history- a spunky brass band called Top Chops that provided crowd-pleasing antics and interplay with the spectators as they marched and played their music. Top Chops also performed in the park later in the day and their performance in the parade was so well-received that they were booked for the 1996 festival before they even left town. This was the first time a parade entry would ever return by popular request. The 1996 festival will be remembered for the biggest rainstorm in the history of the festival. This rainstorm started about 20 minutes after the parade started, and lasted six grueling hours. Thankfully, the festival of 1997 was blessed with bright sunshine for four days of activities, including a classical concert on Thursday night. That year the Band Festival experienced another first: Kings joined Queens in the annual parade. Rockford High School had elected a King beginning in 1995, but 1997 marked the first year other schools joined in. A great measure of success for the North Iowa Band Festival would be the mention of the crowds it attracts. Police have said that as many as 30,000 spectators have watched the parade by lining the streets of Mason City. From its beginning with six bands entertaining folks on the streets of Mason City in 1928, through the incredible Meredith Willson era, to the present-day anticipation of what's ahead, the North Iowa Band Festival has always been a crowd pleaser. It is no wonder that William J. Petersen, writing about plans for the 25th festival in 1963, wrote, "Everyone was looking forward to the 25th. And there was no doubt in anyone's mind that there would be a 30th, a 40th and a 50th. For music is an important part of the very existence of Mason City." It is for that very reason that we know with certainty that there will be a 90th, and 100th.